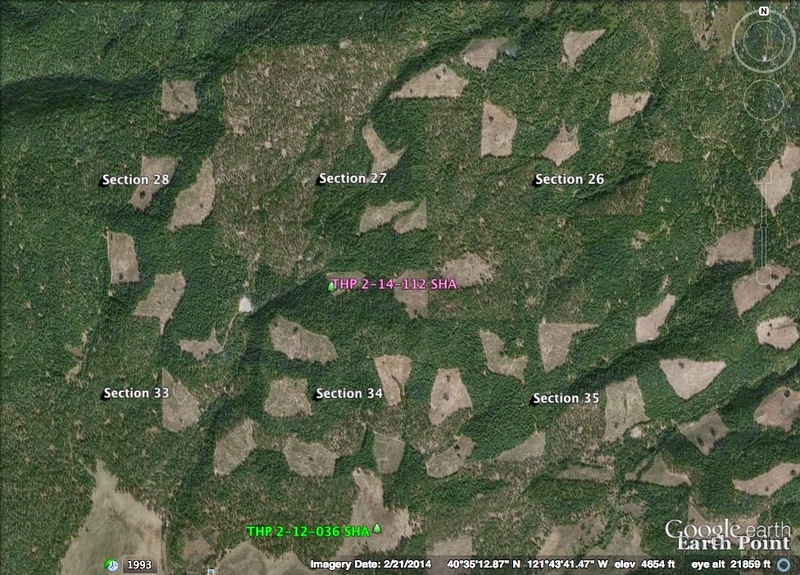 THPBlog: Sierra Pacific Industries to clearcut log NE of Shingletown, CA. Sierra Pacific Industries to clearcut log NE of Shingletown, CA. This THP is about 8 miles NE of Shingletown, CA and about 5 miles north of Highway 44 at an elevation of 4,200 to 5,900 feet. Sierra Pacific Industries is planning a clearcut tractor based logging operation in ponderosa pine, sugar pine, white fir, incense cedar and Douglas fir forests. SPI is planning to use tractors on slopes over 50% grade within unit 262 that do not flatten before reaching a class III (intermittent) watercourse. They also want to be able to construct un-flagged "jump roads" under 500 feet to connect road spurs with landings. 21 road drainage sites are planned for work including rocking, dip construction and culvert repair/replacement. There is a goshawk 2.5 mi north of the THP area, and a California spotted owl was spotted 2 mi east of the THP area. A bald eagle was reported to be 2.5 mi south of the THP area at Lake McCumber, and in 2012 a fisher was spotted .5 mi north of the THP area (section 22). A Western pond turtle was also reported to be in Thatcher Pond near Thatcher Meadows .5 mi south of the THP (section 4). Giant checkerbloom was observed outside unit 282 across the road in a moist area and also in section 34, Coleman’s piperia was observed in unit 260 growing under the shaded canopy of the forest. More information is available on the THP Tracking Center website.